Welfare Interactions are collected from our Support Advisor monthly reports and from the RNZRSA Senior Advisor and Support Services Manager. We work hard to keep a track of these numbers however collecting data from volunteers is an area we continually have to work on. 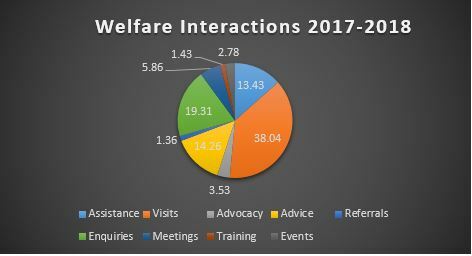 The annual ‘Welfare Interaction’ number is from data we have collected from our volunteers. At this stage we estimate we may only be reporting 25% of the actual welfare interactions that are occurring within our support network every day. Details physical or material assistance to an individual or organisation that aligns to the RSA Support Strategy. E.g. trust grants, physical work, lawn services, working bees, house maintenance etc. Visits to a location for the purpose of the welfare of an individual. E.g. hospital visits to sick veterans, welfare visits to vulnerable people etc. Incorporates acting as an agent of an individual or group in regards to adversarial proceedings. E.g. representing the interests of a person engaged with VANZ, ACC, MSD or the DHB; engaging local media in the views of the veteran community; debating a government representative in the needs of veterans. Providing information to an individual or organisation. E.g. recommending a person seeks legal counsel over an issue, advising how best to engage to a government agency, where to get financial advice, help develop a plan to overcome mental trauma etc. When individuals are referred onto another organisation to resolve an issue or find information they may be seeking. E.g. referrals to VANZ for entitlements, NZDF archives for their service details, local hospital for advice etc. This does not include internal referrals. Enquiries made on behalf of an individual. E.g. calling a taxi to pick up clients, bank enquiries, clarification of policy from insurance companies, cost of vehicle maintenance etc. Meetings between individuals or organisations. E.g. attending family meetings, being a support person for meeting agency representatives with the supported person, attending a meeting with an NGO or government agency, etc. Is defined by the delivery / receiving of training that enhances the capability of support advisors. E.g. presentations to NZDF transition meetings, delivering 1:1 training to a local support advisor, showing a person how to budget, etc. A recognised presence at an organised an event, that promotes veteran health. Examples include, being a guest speaker at a formal event as a representative of the RSA, having a RSA booth at a fair, recognised as representing the RSA to judge a competition etc. Multiple activities completed in one interaction is recorded as one interaction only. Due to the complex nature of support required, multiple interactions can be reported for the same person over a prolonged period of time. It’s the generosity of the public which helps us to achieve these results. To make a donation yourself please visit our website here.